World-Spectator editor Kevin Weedmark interviews Saskatchewan Party leadership candidate Alanna Koch at the World-Spectator office last week. 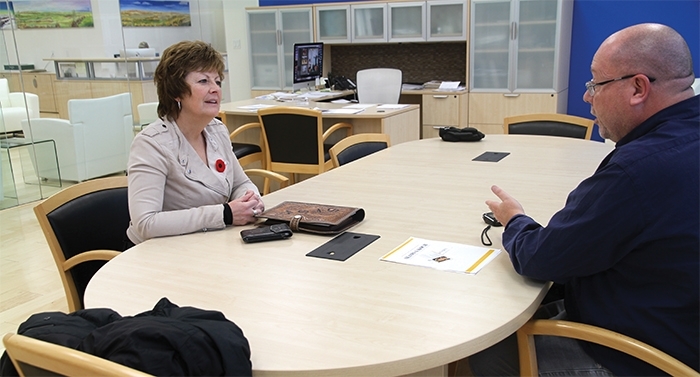 World-Spectator Editor Kevin Weedmark interviewed Saskatchewan Party leadership candidate Alanna Koch when she dropped by the World-Spectator office last week. Following is the full interview. How have you been conducting your campaign? It has been a combination of things. I have made a commitment to get out to every constituency. Sometimes people have gatherings in their home, sometimes they will have it in a community facility, sometimes we will go in on our own and organize it. We are also contacting people by email, the standard kind of campaigning email, direct mail, lots of social media engagement, and we have had some constituency associations organize events and I have been to lots of those. Sometimes it has been industry association or interest groups and I have been attending those. It has been any and all avenues. If I am invited I’ll be there. I think I have put on 23,000 km now and been to 57 constituencies—close to 80 communities. How do you gauge how a campaign like this is going? Do you have a sense of who the front runners are, or of how you are doing compared to the other candidates? We did a poll with a third party provider. It was a poll of the members and . . . it showed the top three contenders were myself, Scott Moe and Ken Cheveldayoff. It also showed on the key ballot question of who is the best to win the election in 2020 and my name rose to the top of that question. I view that as the question that people should be thinking about. At the convention we just had . . . we had an opportunity to give a major presentation and have our third of six debates and I had a lot of positive feedback after that and the sense that I have a great deal of momentum behind my campaign. A lot of the undecided (voters) decided this weekend, and they have decided to support me. You don’t know until the ballots are in, but the sense I have is that things are really picking up and I started strong but am getting stronger. You are the only candidate who is not an MLA—tell me a bit about your background. I have two bookends of government experience. I had a position on the political side of the government many years ago in a previous government and have had several political roles, including deputy chief of staff to the premier, and then the last 10 years I have been in the professional public service side, nine years as the deputy minister of agriculture and one year as the deputy minister to the premier and cabinet secretary. And then I have a whole bunch of private sector experience between those bookends—a non-profit farm organization, a publicly traded grain company, lots of international experience. I went on trade missions, I was a school trustee, ran my own consulting business. The reason I am running is I had so many people approach me and say that the really diverse background and depth of experience I have really had made a big difference in all the other roles I had, really made a difference for Saskatchewan people, and they felt now this was the next step, to be able to continue to make a positive difference and build on what we have seen in the last 10 years with Brad Wall. So what I am planning to do is to really build on that path we have been on and bring my own perspective, my own experience, which is quite different, but bring it to the table so we can stay on this path for Saskatchewan. You were the deputy minister to the premier, what exactly does that entail? I would break it into three roles. Firstly you are the head of public service. I have 11,000 public servants that were my responsibility, to make sure that they had the direction that they needed to get their job done, that they understood what their mandate was, that we were making sure that we were giving them the tools to get the jobs done, whether that be information or skills or training or the right office space. The second part of my job was as the cabinet secretary. In that role I helped set cabinet agendas, I ensured that cabinet ministers had the materials they needed to make informed decisions, and then once decisions were made I provided direction to get the job done on the cabinet decisions that are made. Thirdly in that role of deputy minister of the premier, you are the senior public service advisor to the premier, so you’re there to provide that advice, to make sure he has the information that he needs to get the job done, so those would be the three roles that I would say that are part of that title. Do you believe your experience at that level will help you greatly if you do win the leadership? Yes. I am a very different candidate because of my background and experience and that role that I have had in the senior public service. I know the operations of government. I know when a government’s decision is made, what it takes to actually execute on that decision, and I also know that sometimes you can fine tune your decision to ensure that you get it implemented. Sometimes decisions may have been good ones, but they may have been very difficult to actually implement. So this way I bring the best of both worlds to the table. I would be in this role as the head of the government in the premier’s role working with a strong team of cabinet ministers and caucus members but I would understand exactly how to get the job done on the public service side, having being in the pubic service sector myself, so that we can execute on the plan. That experience that I bring to the table, I think it would make a big difference. Brad Wall is a very popular premier, especially in rural Saskatchewan, especially in this region. How big of a job is it going to be for the next premier to follow up on what Brad Wall has done? We just had a big celebration, a tribute and farewell for the premier this past week at convention and the comment was made that Brad Wall has been the brand for the Saskatchewan Party, and that is the opportunity and challenge for all of us. He has really set a great brand for the party and the province, being very popular, really changing the way we thought about ourselves—it’s much more positive, and everybody else’s view of us is much more positive. I think the opportunity for the next leader is to build on that legacy and stay on that strong path of growth and prosperity for Saskatchewan. The challenge is that he is a very big personality with this huge popularity, so I think the key is none of us are Brad Wall, we can’t even expect to replace him. We are different people. We bring different skills to the table, and I think in that way we will be successful. We should absolutely be proud of where we come from and what has been accomplished by Brad Wall, but here is who I am, here is what I bring to the table, here is the path that I am going to be on and the style that I bring to the table and the skills that I have. There is no way that you are going to fill his shoes. I always say that I have a completely different pair of shoes but I walk on a very similar path as Brad Wall. How do your policies differentiate you from the other candidates? We are all from the same party so you would expect a lot of our general policies would be quite similar, but I have differentiated myself by putting out what I would say is the most comprehensive policy platform in my document, which is building on a legacy, a vision for 2030, and in there I have said some key things which I think are quite different than the other candidates. I have talked about having a four-year rolling infrastructure plan and maintenance plan, so that plans drive budgets. That is a bit different than the other candidates. I’ve talked about taking an extra year to balance the budget so that we could ensure that the restraint measures that we had to do because of our tighter economic and fiscal times, that we make sure that we have compassion and that we understand that those consequences can be sometimes too difficult for people. So that extra year gives us some time to make sure that we hold back on some of the changes and make sure we are taking care of people the way we should. On the human services side I focused on wraparound services—that’s a bit of a different thing that other candidates don’t talk about. Health, education, social services, justice, even some of our community partners in mental health and addictions, that we co-ordinate and wrap services around people. They have a got a really good model in PA and Yorkton. We want to have that everywhere. The key thing that I think differentiates me from the other candidates is how I would govern. I am going to establish a premier’s council, bring a lot more outside advice in, that is how I have operated every organization I’ve been in—bringing in expertise from outside, being a little bit more open, having stronger communication, being more open and transparent than I think any of the other candidates have promised to do. With my mandate letter, which again is unique, I put that out as a promise to the membership and the Saskatchewan people on how I would lead. You said you’ve been to most of the constituencies already. What are you hearing out there? What do people seem to be concerned about? I’ve heard that people do think we are on a good path. They are excited to see the change in Saskatchewan over the last 10 years so. They want to stay on that path of growth and prosperity. But what I have heard also is that maybe we weren’t as connected and engaged with our public as we started out to be, that maybe we need to get back to that—being open to ideas, being a little bit more willing to get out and have conversations with people about what could be better, what might not be quite right. But I also have heard a great deal of enthusiasm for the future, that they really see that this is an opportunity for the party to have that renewal and have that re-engagement with membership, and they are excited about this race and what it means for the party and what it means to win the next election in 2020. The leadership race has really reignited the membership. Lots of times people have been Sask Party supporters but have never had a reason to have a membership and now they do because they have one of five people to vote for, and we had over 800 people watch the debate in Saskatoon in the convention. It was a full room and it was electric with energy and excitement about the future. With the leadership race do you think there is increasing interest in Regina and Saskatoon? In the cities as opposed to rural Saskatchewan? I wouldn’t say there is any difference at all in the interest right across the province. I would say small towns, big cities, farmers, business people, no matter where they have been, citizens, moms, even youth, we have seen a lot of youth be very interested in this race. Their views have not really differed across the province. I would say people are really interested in this race. How they can have their voice heard, how they can bring their opinions forward, the influence they can have on the leadership candidates really hasn’t differed. We’ve had tremendous response right across the province. Like I said the convention was huge. We had huge turnouts from cities and rural I really wouldn’t have seen a difference. Every constituency was well represented. What is the biggest challenge the next premier will face? The biggest challenge will be staying on this path of growth. Despite the fact that we have seen a little bit tougher times in our economy the last two years. How do we keep growing? We are still having population growth. How do we provide the services that are required by our growing population? Again it is this balance of growth, but at the same time growing with compassion and making sure we have got the fiscal capacity to meet the needs of our growing population, of our growing industries of our sectors that still require the services—all of the appetite for human services and some of the challenges that we see in health, education, mental health and addiction, some of those things. So it’s just that constant decision making of balance that governments need to have and continue of the path of growth, and I think that is a key challenge for a leader and connecting with their audience and being able to communicate that message with the government and how we’re going to stay on that path of growth. What have you learned personally from being involved in this leadership race? Well I have probably learned more about Saskatchewan. I lived here my whole life and I thought I knew a lot about the province and I have travelled around the province a lot, but I have seen even more of the province than I have ever done before and I’ve learned a lot more about who we are and all the really interesting people we have in the industries and the companies and the businesses and how vibrant the main streets are in some of our smaller centres. I probably knew that, I just didn’t know the depth of it and how much richness and diversity we have in the province as well. I have just seen all of that since August 28. It has been a full immersion in Saskatchewan. How will you judge your success in this race? I’m in this race to win it and that is the measure of success. Am I going to be to elected as premier or not? Personally I’ve done a lot of great things in my life and will go on to do great things, but I’m very focused on winning this race and that will be the measurement of success or not. I’ve got to be victorious in this race so I can continue to make a difference for Saskatchewan people, that will be the true measure.